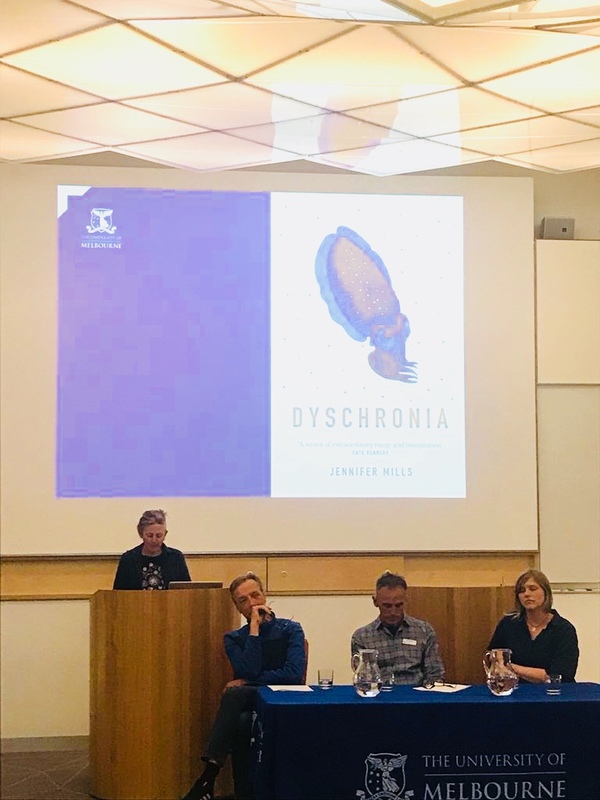 I had a great day at the University of Melbourne at Extinction in/and Australia – it was fascinating to hear from so many scientists, biologists, conservationists, philosophers, cultural theorists and other writers, discussing how we think and what we do about extinction in the Anthropocene. I was particularly impressed to see so many different conservation techniques in action, and hear how communities can get behind local efforts to aid particular species or places (citizen science ftw!). I was also excited to hear about de-extinction efforts in regard to the thylacine, which reminded me of The Lost, a reflective piece I wrote back in 2013. It was great to discuss Dyschronia in this wider context. Some scientists really responded to my ability/tendency to talk about feelings… several people spoke of the importance of story and narrative in their work, which was wonderful to hear. I am still deeply interested in the emotional terrain of extinction grief and whether that work can be useful. I’m sure I’ll follow these ideas up in my non-fiction at some later time. For now, fiction demands my attention. Next week I’m heading back to China for a month to do some more research/detail-gathering for the novel I’m working on. It is exciting to be returning, though given how much Beijing can change in two years maybe that’s the wrong word to use. Alas, my Mandarin has not improved by being mostly ignored all that time! But perhaps some of what I learned will come flooding back when I hear the marble-mouthed music of beijinghua all around me. The trip is made possible by the generosity of the Copyright Agency Ltd – I was recently awarded one of six CREATE grants to work on this novel and I’m thrilled to be able to give it the time and attention it needs. CAL do excellent work for writers in terms of advocacy and distribution of fees – if you’ve published anything, you should be a member (it’s free). This was written by jenjen. Posted on Friday, September 28, 2018, at 2:54 pm. Filed under Dyschronia, environment, the apocalypse. Bookmark the permalink. Follow comments here with the RSS feed. Both comments and trackbacks are currently closed.